Since starting blogging I've had the opportunity to discover lots of amazing websites that I might not have had the chance to otherwise - good for me, bad for my bank balance. One of the ones that falls into this category is Koshka, an online dream-boutique that stocks pretty much every single one of my favourite brands - think UNIF, Minkpink, Cheap Monday, Evil Twin, the lot. When they asked me to pick an item to style I ended up spending half the night on the website, finally choosing this Minkpink dress. I don't think you can go wrong with a simple shift dress and I can't wait until summer arrives so I can whap this baby out on its own. When my parcel arrived it was wrapped up in the most amazing rainforest-print paper and I had no problems with customs fees or anything like that, so, all in all, the perfect shopping experience. I'm off now for a Dominos, it's been a good two weeks since I last had one and I'm starting to get withdrawal symptoms. Plus we have a 50% off voucher so it'd be rude not to. Eeeeeeeeeep! Twinnie you are look beyond foxy in this post. Never heard of Koshka before but they sound rad, I'm such a MinkPink junkie. Pure hotness overload! Love this outfit! The necklace is gorgeous! Love this outfit! Especially the boots - really wishing I had a pair of those! Where is your silver cuff from...? Such a lovely outfit - As always! Beautiful dress! I had a dominos last night it was flipping epic but I did get the immediate shame/guilt after I'd finished haha!! Gorgeous outfit, and I love your hair! I've got a dominos discount code as well which is definitely getting used either tonight or tomorrow! yum yum yum. omg omg omg your hair and your boots SO perfect ♥ I really love ! That's the most amazing website! I love the dress on you as well! I love this dress so much, and your hair looks absolutely gorgeous in these pictures, seriously beautiful! So amazing! love the dress! I hope your pizza was yummy! You look fantastic and I found this outfit really made your highlights stand out in your hair too. The dress is so gorgeous, and looks great with the jacket. I always love what you wear! I really love white dresses! As always, I have major hair envy. I'd LOVE it if you would do a hair tutorial or hair care post!! 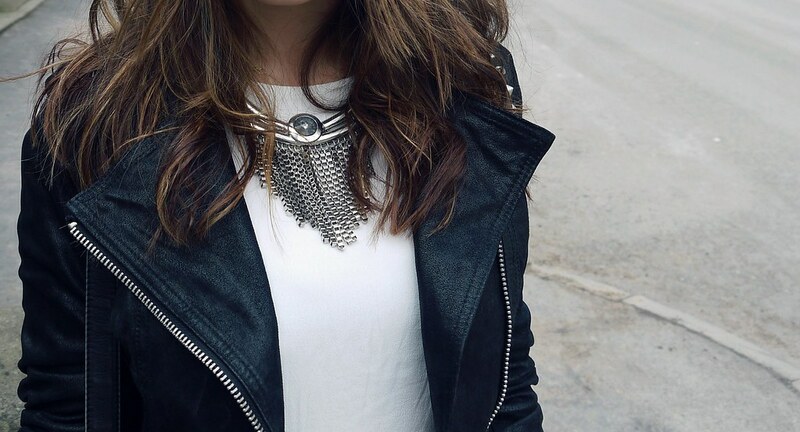 Love the combination of the smart dress with the leather jacket! Looks fab! Giveaway winner of your ring giveaway? I love this outfit! And I think the highlights in your hair look fantastic! I love your blog! You have great style and taste! Your hair looks amazing, I love how that leather jacket really roughens up the dress!